Most motorhome owners will consider towing a car with them when traveling. That way you don’t have to close up camp every time you want to do a little local sightseeing or run to the store for a quart of milk. There are a number of things to consider when you’re choosing the right RV tow dolly. Though they are all similar in how they work, not all tow dollies are created equal. A tow dolly is a small, 2-wheel trailer designed to carry the front wheels of your car while the rear wheels remain on the road surface. Because most modern cars are front wheel drive, this means the drive train remains motionless. No mileage is accumulated on the odometer, and no wear is taking place on the car. Loading and unloading is relatively simple and straightforward. The tow dolly itself is rather small, so it takes up less space than a trailer. No modifications are made to your car. In most cases, the tow dolly has its own braking system (also requiring no modifications to the car in tow). #1 – Those that have a center pivot allowing the car to track around corners. These are all quality products, but they’re considered economy models because the trailer wheels are fixed and the center pivot point is the means by which the car can track around corners. #2 – Those where the trailer wheels are mounted similar to the front wheels on a vehicle. They pivot on king pins and track around corners without the towed car moving on a pivot between the trailer wheels. These are considered upgraded models over the basic, economy tow dolly. The main advantage I see with this style is that it lessens the chance that the car body will come in contact with the trailer fender or wheels in a tight corner. 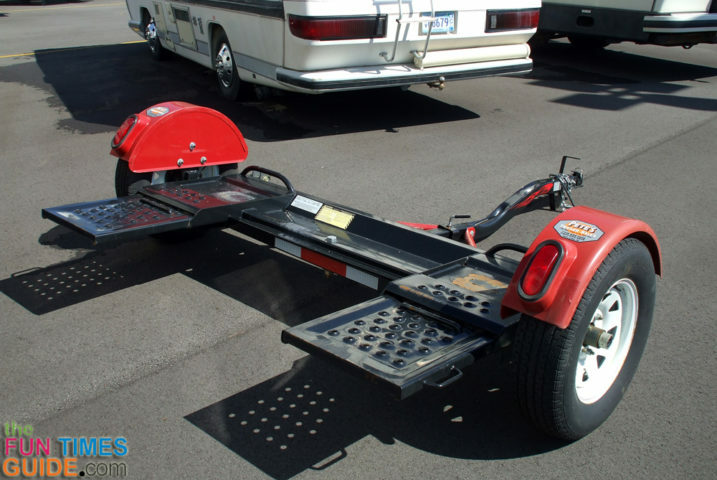 Deciding which of the 2 RV tow dolly styles best suits your needs is a personal decision. One thought though: U-Haul tow dollies are of the center pivot design. With U-Haul’s liability concerns, it pretty well confirms that both styles are safe and will serve you well. There are a few more things to consider before you make your decision on which brand and model of tow dolly will work best for you. Braking and lighting are both required by law in most states. How you accomplish this is up to you. Some tow dolly models have electric brakes, similar to your standard travel trailer. Simply install a brake controller in your motorhome, then you are set to go. Others have what is known as surge brakes. This means when the trailer senses the shift in load as you slow for stopping, the brakes will automatically be applied. The nice part about this is you don’t need to install any additional equipment in your motorhome. It’s all built into the tow dolly. Lighting is usually supplied on the fenders of a tow dolly. In most cases, you will need to have operating tow lights on the rear of the vehicle in tow as well. You can do this by installing wiring to your car that will allow its factory lights to be operated by the lights of your motorhome. Another choice would be a removable light bar or system that can be attached to the rear of the towed car and removed upon arrival at your destination. When it comes to braking and lighting, it’s all a matter of convenience versus cost. 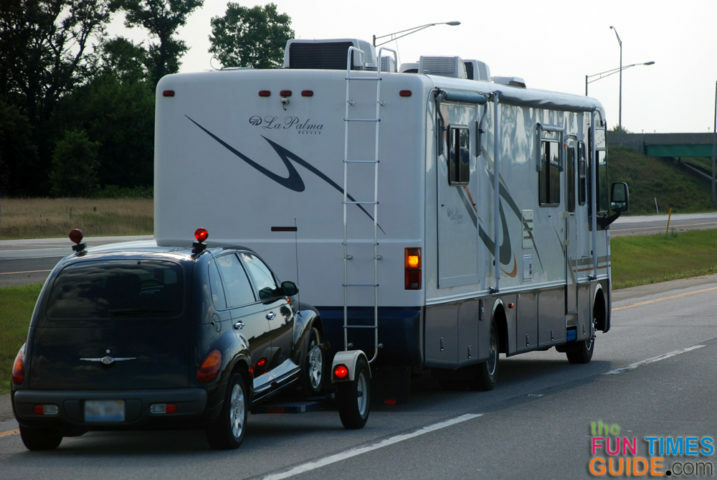 All are safe ways to transport a vehicle behind your motorhome. Some are just more user-friendly than others. Another thing to consider is whether you want to transport your “toys” along with towing your car. For example, some people want to bring along an ATV. Others like to take their motorcycle when they travel. This can easily be accomplished with a tandem tow dolly. One final consideration: be sure to read the owner’s manual of your anticipated towed car. New car models may not have a steering wheel lock. Being able to lock the steering is mandatory so that the car doesn’t drift back and forth causing damage to the side panels when cornering. Such is the case with my 2013 Dodge Caravan. The manual clearly states that it cannot be towed on a dolly.